2/1/2013 – The problem simply won't go away. The latest incident involves the former mayor of an Italian town who has been banned for allegedly using a hidden micro camera and earpiece to receive electronic assistance in tournament games. The ACP has launched a petition for players to get FIDE to address the general cheating issue. So far 517 players have signed, including 190 GMs. A former mayor of the northern town of Buccinasco, near Milan, Loris Cereda, has been banned for allegedly using dark glasses that had been fitted with a hidden micro camera in at three tournament games. The glasses sent live images of his opponent's moves to a powerful chess software programme that then dictated through a secret earpiece the correct counter-move to make. 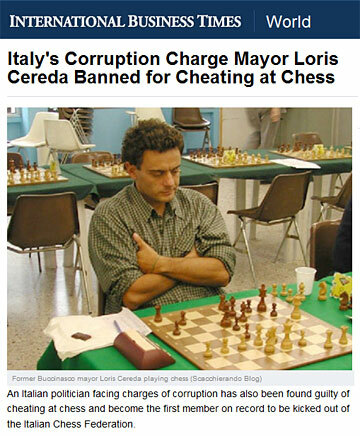 Cereda, a member of Berlusconi's People of Freedom Party, was exposed by fellow players who had witnessed a sudden improvement in his game. Cereda was transformed from a mediocre amateur player into a local Garry Kasparov, they said. Cereda said: "I've never cheated nor used strange technology during matches. There have been tournaments in which I played well but also many others which went badly. Nearly all the tournaments were played in the presence of a referee and a fair number of spectators. My mistake has been not to show up in front of the judging panel but I didn't want to fuel controversies that could have damaged the world of chess that is my passion and has been part of my life for 40 years. I've never been less than a good sport and as someone who loves this sport, I could not imagine doing such a thing." Cereda is also facing corruption charges after he was allegedly filmed taking a €10,000 bribe to green-light the construction of a car park next to a shopping centre. Addendum (May 4, 2018): Loris Cereda informs us that sentence of appeal, some months later, exonerated him from any responsability, declaring his complete innocence. "Actually my only fault was to consider the accusations so foolish as to not present any defense to the first court" he wrote. "Amazing this court, without any proof, declared me guilty. Then, at the appeal level, I demonstrated that nothing was true in the accusation package. The games themselves were totally outside any assisted performance play. The glasses were a well known model with LED light, used to read in the night. Finally the three accusers, when asked about the color of the "alleged earphones, declared three different versions. In the end, four months after the ban, I returned to tournament play, simply demonstrating my strength. You can easily check it on my FIDE profile. This article by Dave McKenna tells us that the supremely old-school game of chess is dealing with a very avant-garde brand of unsportsmanlike conduct. It starts with a player named Clark Smiley, rated 1875 on the USCF list, who had won nine of the twelve tournaments he had recently participated in, and was crushing a much stronger opponent at the 2012 Virginia Scholastic and Collegiate Chess Tournament. He was entering his moves on a handheld Dell computer, using a scorekeeping app called eNotate, which its designers had convinced the USCF was fail-safe for cheating. During the game tournament director Robert Getty spotted something fishy about the way Smiley consulted his personal digital assistant and moved in for a closer look. He halted the match and asked to see the PDA. Smiley pulled away and turned off his device, but after several uncomfortable seconds he handed it over without saying a word. Getty fired up the Dell again, and no scoresheet appeared. Instead, a screen popped up for a program from the Fritz line of so-called "chess engines. "These are super-smart, user-friendly apps," said Getty. "By pushing all the right buttons on a good chess engine, any Kardashian sister could conceivably checkmate Fischer." Smiley admitted to Getty and others that he'd cheated, but claimed that this was the first and only time he had ever accessed an illegal program. Still he was thrown out of the tournament and, despite his unadvanced age, the Virginia Chess Federation used Smiley's name in their announcements of the suspension, one sign of how seriously they are taking the offense. According to USCF president Bill Hall, Smiley is, at 16 years old, the youngest computer cheat ever brought before the national sanctioning body. Smiley now faces a lifetime ban. There follows more details about Smiley, the investigation of the case, consequences, and a history of other cases of chess cheating in this extensive Grantland report. The ACP sent us the following appeal, which we can only pass on to our readers with the urgent request to sign the petition. It may well get things going in FIDE to do something about the problem. The ACP has been discussing the problem of computer-assisted cheating in chess for a long time. Now it is time to act. As a first step, we need to collect the voices of the chess professionals who believe that cheating in chess is a major problem. Immediately thereafter, we shall turn to FIDE with the request to address this issue urgently and to take the required steps (we are in the process of polishing up our proposals). Of course, it is crucial that as high a number of chess professionals as possible signs our petition. Please click here to raise your voice and to help all chess professionals to engage their battle against cheating! Sign the ACP's petition for urgent action to be taken in the field of computer-assisted cheating and add your voice to that of your colleagues. Now! 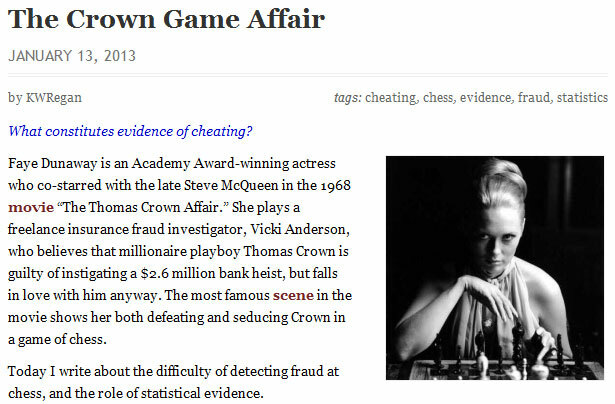 Dr. Kenneth W. Regan, an associate professor of computer science at the University at Buffalo, who is also an IM at chess, has been researching the problem of cheating for more than five years now. He has written software to check for cheating has been called as an expert witness in recent cheating scandals. Click on the above screen shot to read his latest article, and don't miss the Slashdot discussion of it. 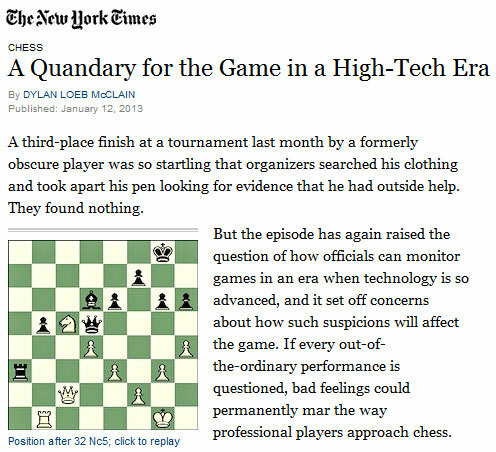 Cheating in chess has also been in the New York Times repeatedly in the past year. Click on the screen shot to jump to the most recent article. 08.01.2013 – Recently we reported that the incredibly brilliant play by a 25-year-old untitled Bulgarian player at the Zadar Open in Croatia had raised suspicion that he might have been using illicit electronic assistance during his games. A number of readers criticised us – for linking to the mainstream Croatian media reports?! One of them, an expert in the field, actually analysed all the games in question. 17.01.2013 – Recently a 25-year-old untitled Bulgarian player scored 6.0/9 points in a strong GM tournament, with a 2697 performance. His opponents complained, he was searched, and no electronic equipment was found. Still, the case put chess on the front pages of the mainstream media, and led to intense discussions on the Internet. Now Ivanov has given the Russian news portal WhyChess an exclusive interview. 30.10.2012 – It will surprise nobody that there were a very large number of messages that poured in regarding our recent report on the disqualification of a Bundesliga player for carrying a cellphone to the bathroom during his games. Here's a small selection of letters, plus a thoughtful article by Assistant Professor Kung-Ming Tiong of Malaysia, comparing the problem in chess with academic cheating.